Augmented reality has actually been around in the sports industry since 1998, when the first virtual down marker was seen on television during a live football game. Today this budding technology has a lot of other ways to expand sport for fans, as well as for sportsmen, be they amateurs or professionals. To play better: Augmented reality could allow for players to change the way they play the game. 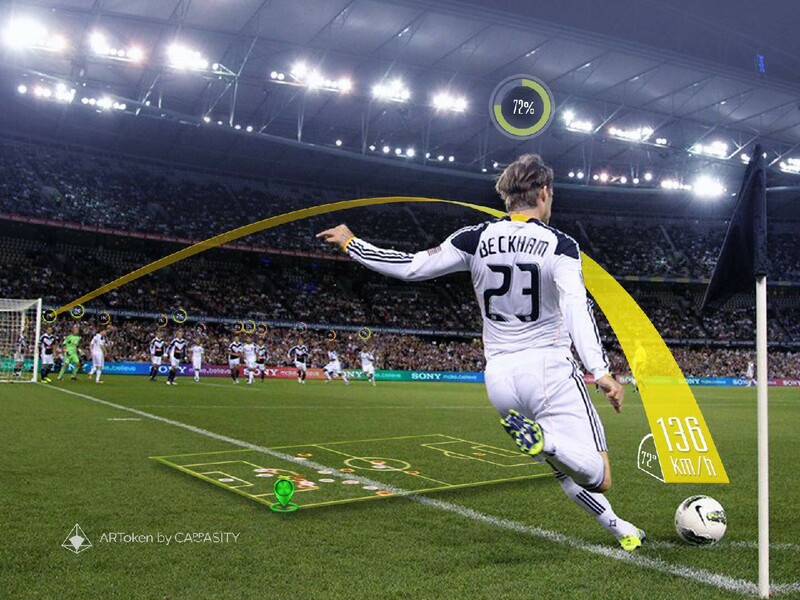 Football in particular lends itself to AR, as the players would be able to have real time data streamed to their visors in a Google Glass-like overlay, allowing them to see things such as the position of other players, the incoming speed of the ball, and the time left in the match. Or let’s take golf, for example: imagine a player on the practice green lining up for a putt and seeing the break of the ball before he even hits it. In fact, PuttView company has recently offered such a product. PuttView focuses on putting practice enabling players to visualize the ideal ball path and see relevant practice information. While players cannot necessarily use the device on the actual course, the goal is to improve putting performance. To get closer: AR can be utilized across all merchandise and physical objects — for instance, ZapWorks partnered with Manchester City FC to implement AR into the match-day programs their fans pick up at every game, creating entertaining content for supporters. This tool is actually bringing fans closer to their idols through AR and the digitizing of the match day program. This type of content can be tailored to each individual sport or team. For example, clubs can incorporate a fun mobile mini-game involving their key players, take their fans on an exclusive video tour of the stadium or even provide the chance to enter a competition to meet their favorite stars. These augmented experiences enable teams to create a personal touch and a feeling of community, increasing retention of fan loyalty. To see more: The experience of a sports fan is not what it used to be: today they wish to interact with their favorite teams and player, not just watch. For example, FOX Sports has been utilizing the technology during its NFL broadcasts to show different graphics that enhance the viewing experience. Startups in the sports world were the first to have taken notice of changing audience behaviors and are delivering solutions to bring sports action to viewers. But major organizations have an opportunity to disrupt their own products and revamp live sports for the better. Here are just some of the numerous examples. The Baltimore Ravens are transforming the fan experience with the use of AR by creating an image of the fans with computer-generated face paintings. Apple has announced that their IOS will create new opportunities within apps for sports fans. The MLB At Bat app will provide fans with a unique augmented reality adaptability when they use their mobile device at the ballpark. AR has also entered the youth soccer world with a product known as DribbleUp, which offers youth soccer athletes supplemented coaching and training at their fingertips. Even Fantasy football is part of the AR trend by creating a way for owners to draft players using their mobile devices through GPS and augmented reality, similar to Pokémon Go. The Sacramento Kings are using it to enrich the fan experience by allowing them to take pictures alongside players in their new uniforms. And there is much more to AR in sport to be explored! Reality technologies are forecast to disrupt many markets in unique ways, and the sporting industry are lucky enough to be able to see how AR can be embedded within their teams and clubs. Whilst sports fans are absolutely loyal, harboring the potential of emerging technologies will drive customer engagement and ensure teams are using the most beneficial fitness and marketing techniques.